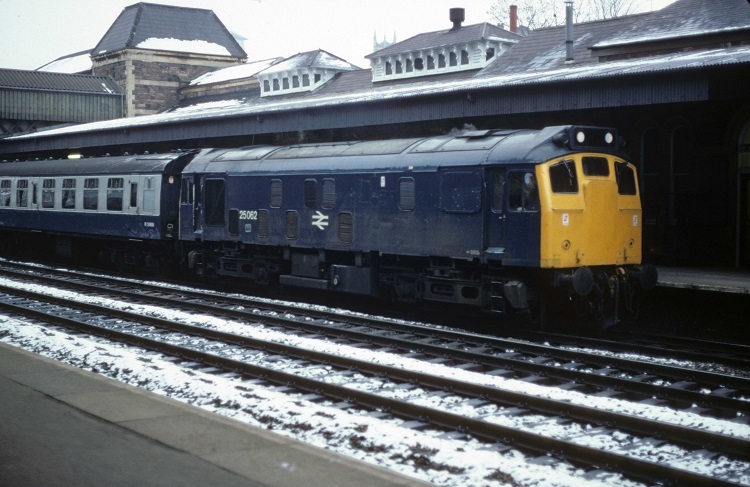 Photograph courtesy Roger Geach 25062 at Newport on a Cardiff - Crewe service on February 22nd 1981. The nineteen and a half year career of 5212/25062 included five years on the Scottish Region, the remainder being allocated to London Midland Region depots. 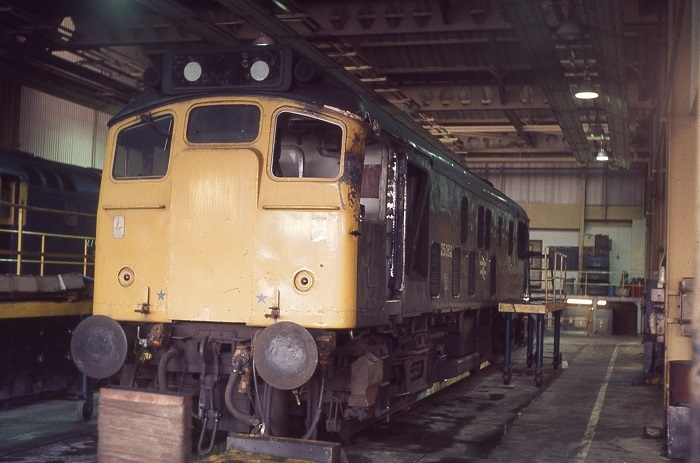 Last Class 25 to receive a General Repair at Glasgow Works. Time between last Classified repair and withdrawal: 29 months. Time between withdrawal & scrapping: 28 months. January 1965 to London Midland Midland Lines LMML. August 1972 to London (Western Lines) Division (D01). After withdrawal 25062 was moved to Derby Works during January 1983, remaining here for two years before heading south to Swindon Works on February 4th 1985 (movement details below). 25062 was broken up there by the end of April 1985. 25050/062, 25129/133/146, 25220/233/274/294 9X12 Derby – Swindon February 3rd - 4th 1985. Noted Glasgow Works March & April 1976. Noted Glasgow Works June & July 1980 (General). Similar to a few Class 25s the first recorded passenger working for 5212/25062 was the roundtrip Nottingham - Llandudno Town, so noted on September 3rd 1966 with 7536. The failure of Class 40 No.310 on January 14th 1969 at Brock on the 10.40 Glasgow Central - Birmingham New Street saw 5212 & 5291 assisting from Preston, presumably to Birmingham New Street, but may have come off at Crewe. On July 1st 1972 5212 & 5211 worked the 09.20 Manchester Piccadilly - Yarmouth to Lincoln Central returning with the 09.28 ex-Yarmouth. Three weeks later on July 20th 5212 & 5199 worked the 10.30 St. Pancras - Derby throughout. 5212 & 5289 were a little off the beaten track on August 25th 1973 when they were noted on an Edinburgh - Inverness working. On June 17th & July 17th 1974 25062 worked the 00.35 Manchester Victoria - York. A week later on July 24th 25062 rescued a Glasgow Central - Leeds service at Blea Moor when 40094 failed. The empty Heaton - Red Bank vans were worked by 25062 on May 20th. During August 1975 25062 was transferred to Eastfield, spending the next five years primarily on Scottish Region services. In this time 25062 no doubt covered most of the routes that a Scottish Region Class 25 could be diagrammed for. 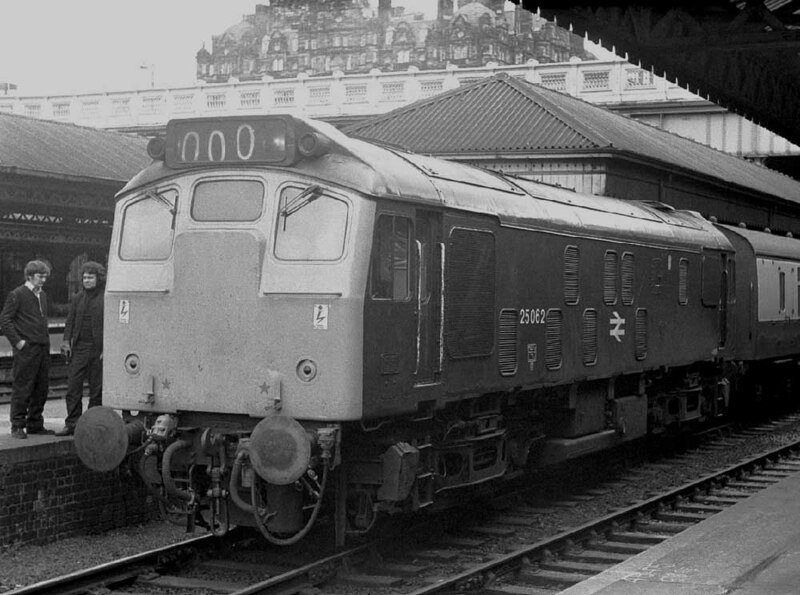 Photograph courtesy Tony Sayer 25062 on June 5th 1976 at Edinburgh Waverley. 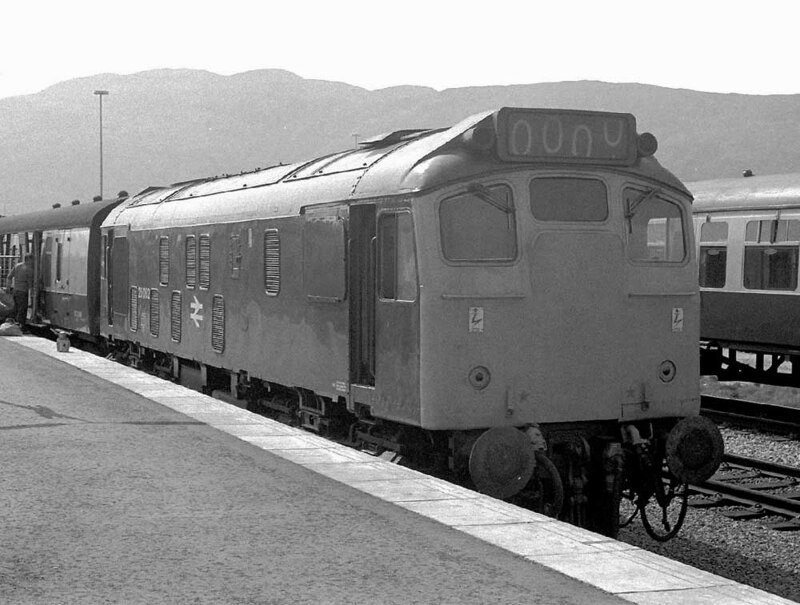 Photograph courtesy Tony Sayer 25062 on June 8th 1976 at Fort William. On the afternoon of June 23rd 25062 worked a five coach special from Edinburgh to Stranraer to connect with a Sealink sailing. An unusual duty for 25062 on July 9th was to inspect the line between Inverness and Carr Bridge for effects from a major forest fire in the Daviot Moor area. Having reached Carr Bridge it was used to pilot 40072 on a northbound passenger service, at Tomatin the pilot rejoined 25086 on a southbound working. Damage to the railway property was minimal, mostly burnt grass and shrubbery. 25062 and the Dundee breakdown crane were in attendance at Perth stabling point on September 11th to assist in the rerailing of 26025 which had fallen on its side after running through trap points! On January 11th 1977 25062 worked the 07.52 Oban - Glasgow Queen Street and the 12.55 Glasgow Queen Street - Oban. On July 23rd 25065 & 25062 worked the 10.05 Glasgow Queen Street - Inverness service. The next day (24th) the same pair worked the 16.30 Inverness - Edinburgh forward from Perth, returning with the 22.55 Edinburgh - Perth. On September 23rd 25062 was noted at Eastfield depot receiving repair to damage sustained to the No.1 end cab, driver's side (see below). 25062 at Eastfield on September 23rd 1977. A long distance railtour on June 3rd brought travellers from Spalding to Fort William. 25062 & 25230 took over the special from 47218 at Motherwell (also reported as Cowlairs) but got no further than Dumbarton Central where they were replaced by 25246 & 27029, with 25062 failed en-route at Bowling . Shortly before Crianlarich 25246 overheated and was declared a failure. 25232 which was travelling light engine southbound, was added at Crianlarich, 25246 was dumped on the Oban line and the train left for Fort William behind 25232 and 27029, arrival being over two hours late. The return leg utilised 25232 & 27029, with both having been carefully inspected at Fort William before being assigned to the return journey. However 25232 failed at Corrour and was dumped in the station. 27029 soldiered on to Bridge of Orchy where 27043 was transferred from a late running Glasgow Queen Street - Mallaig service, which had 37018 as the train locomotive. Despite all the problems the pair of Class 27s reached Cowlairs virtually on time, with 47218 returning the excursionists southbound. The 07.38 Dundee - Glasgow Queen Street was worked by 25062 on August 15th. On September 1st 25062 was working well when it was called upon to assist the 19.20 Kensington Olympia - Inverness nineteen vehicle motorail forward from Tomatin to Inverness when 47517 failed with an oil leak. Later the same month 25062 was busy on the Dundee - Edinburgh/Glasgow services. 25062 was noted at Inverness depot on April 28th. During 1979 25062 was noted on several Edinburgh - Dundee/Stirling/Perth services. A lengthy outing took place on August 18th when 25062 & 25007 worked an SRPS railtour from Dundee to Oban and return, a total of 331 miles. 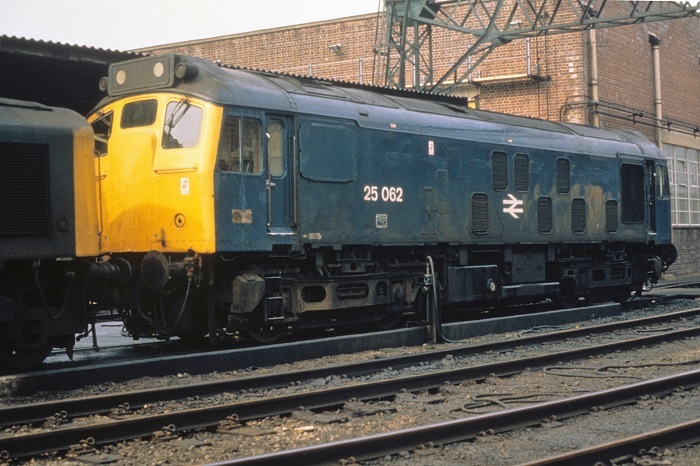 During 1980 classified repairs (general or intermediate) would end for the Class 25s, with a total of twenty seven completed in that final year, Derby outshopped seventeen, Glasgow handled ten. The last from Glasgow were 25234 Intermediate October 1980 and 25062 General June 1980 whilst the last from Derby were 25080 Intermediate August 1980 and 25278 General, released on January 23rd, 1981. 1980 brought a variety of workings in Scotland, including May 2nd's 22.00 Stranraer Harbour - Euston as far as Carlisle with 25065. Several trips between Glasgow, Dundee & Edinburgh followed, a longer trip took place on November 4th with 25062 & 25230 working the 08.15 Inverness - Glasgow Queen Street and 13.10 return. The transfer of 25062 to Longsight during 1980 saw its passenger duties transfer to south of the border, though it would manage several more Scottish passenger turns. On December 29th 25062 worked the 15.40 Manchester Victoria - Bangor & 19.25 return. 1981 was a busy year for 25062 with a varied list of passenger workings. On February 23rd 25062 completed two Cardiff - Crewe round trips, a total of 556 miles. Three days later (26th) 25062 worked at least the 15.10 Cardiff - Crewe. 25062 was the Manchester Victoria pilot on March 7th. Another Cardiff - Crewe round trip was handled on May 9th, then followed much activity in the Derby area commencing May 23rd when 25062 & 25083 worked the 08.35 Derby - Yarmouth to Norwich, returning with the 14.20 ex-Yarmouth from Norwich. The next five days saw the same pair working round trips to Skegness, a relief from Alfreton & Mansfield (24th), Burton on Trent (25th), Derby (26th & 27th) and Burton on Trent again (28th). Two weeks later on June 13th 25062 worked the 07.35 Nottingham - Llandudno Town & 13.26 return. During July 25062 was transferred to Kingmoor. Class 25s continued to be frequent visitors in the Bristol area, parcels workings being frequently handled, the 12.10 Penzance – Glasgow left behind 25062 on August 10th. On September 14th 25062 worked the 08.40 Carlisle - Glasgow Central and on September 23rd the 05.35 Cardiff - Crewe. On October 10th 25062 was north of the border working the 07.39 Dundee - Glasgow Queen Street with 27020. The 'Cathedrals Express' charter was worked roundtrip Bewdley - Paddington (?) by 25062 & 25027 on October 31st. And finally for 1981 25062 & 40170 worked a Southport - Bridgnorth 'Severnsider' railtour as far as Manchester Victoria on December 29th. Photograph courtesy Roger Geach collection. 25062 at Longsight, date unknown but probably 1981/1982. The locomotive exhibits typical features of an overhaul at Glasgow Works: the larger numbers positioned on the bodyside, the deflectors at the bottom of the cab doors and the 'Fire Apparatus' notice stencilled on the bodyside above the No.2 bogie. 1982 was 25062's last year in traffic and its continuing allocation to Kingmoor clearly influenced its passenger duties. However its first recorded passenger working in 1982 was on February 15th with the 13.15 Birmingham New Street - Norwich. On March 11th a train of Mermaid ballast wagons were noted through Wakefield Kirkgate behind 25062 & 25220. Several Scottish workings followed, on March 15th a round trip Carlisle - Glasgow Central was worked followed on March 20th with the 11.05 Perth - Edinburgh. On April 24th 25062 was noted southbound through Hellifield with a loaded ballast trains from Ribblehead. 25062 was stabled at Warrington Arpley on May 8th. The last weekend of May proved to be busy, on May 29th 25062 & 25141 worked the 10.10 Euston - Aberystwyth forward from Birmingham New Street, returning with the 16.05 Aberystwyth - Shrewsbury. The next day (30th) the same pair worked the 08.45 Birmingham New Street - Aberystwyth forward from Shrewsbury, then a Aberystwyth - Machynlleth round trip, before heading back with the 18.15 Aberystwyth - Euston to Wolverhampton. One last trip was worked over the Cambrian on July 24th with 25132 on the 07.40 Euston - Aberystwyth from Wolverhampton, returning with the 14.00 Aberystwyth - Shrewsbury. The final passenger workings for 25062 were over the Settle & Carlisle. On October 25th 25062 worked the 10.00 Carlisle - Leeds & 16.05 return. On October 28th 25062 was noted with a rake of empty mineral wagons eastbound through Guide Bridge. Finally on November 11th the 08.57 Leeds - Carlisle and 15.37 return. 25062 was noted at Liverpool Lime Street with three Sealion ballast wagons on November 21st 1982. 25062 was withdrawn on December 20th 1982. Page added April 27th 2013.